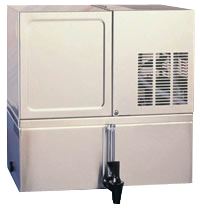 This Series 7000 is a countertop Model that is directly connected to the water supply for continuous operation. The reservoir is designed for front or side mounting of spout. Photo shown with front mounting. Contertop Model 7000 (3.5 Gallon) W:11" D:17" H:17"
Floor Model 7000-8 (8 Gallon) W:11" D:17" H:36"
Floor Model 7000-12 (12 Gallon) W:11" D:17" H:42"